The four-day St. Pierre-Jolys Frog Follies and Agricultural Fair is about to launch for another year on Thursday. The event will mark its 42nd year with free entry to the festival grounds throughout the weekend. 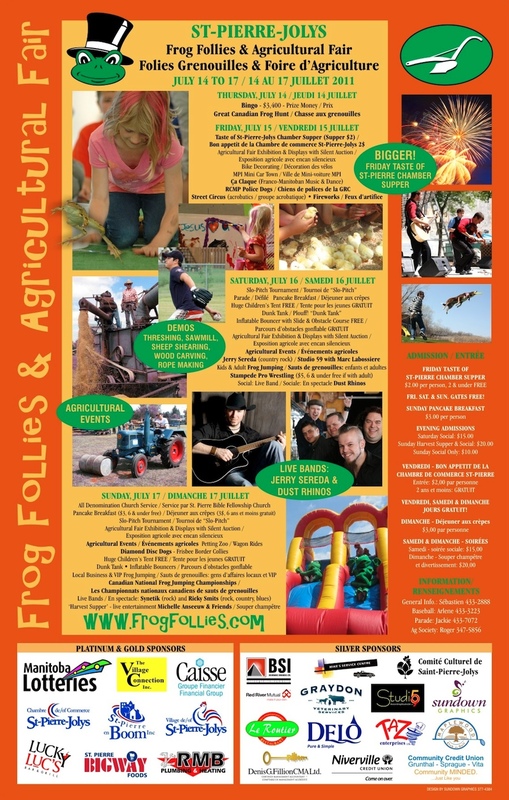 For the second year in a row, the Ag Fair will play a large part in attracting people to the community by running simultaneously with Frog Follies. Highlights this year include country music star Jerry Sereda and Dust Rhinos. Local musician Marc Labossière and the Studio 59 Showcase will perform on Saturday. For a more “hands on” experience, there is always the Canadian National Frog Jumping Championships where you can race a frog for amphibian supremacy. The festival runs until Sunday, July 17. Download the official poster for further details and a complete schedule of events.